We’re pleased to report that Lansdowne students picked up two CIFE awards this year. Simina Popescu won a 2017 CIFE Award for Visual and Creative Arts, and Shiyoun Kim received a College Award for her exceptional contribution to life at Lansdowne during her time with us. 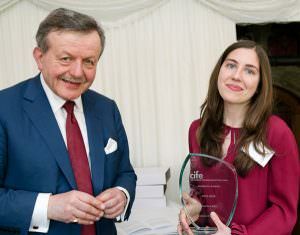 Both students received their awards from CIFE President Lord Lexden at a ceremony in the House of Lords this April. Simina joined Lansdowne College in September 2015 from the Nicolae Tonitza High School, Romania. Prior to joining the college she had already received commissions for her art work and had work published in various media in Romania. Assessing her art work prior to admission, David Mullen of Lansdowne College stated ‘Her work is excellent; it shows advanced observational drawing skills, which is the most important attribute to look for. There is an interesting range of marks in different media, which shows a good understanding of how to manipulate materials.’ Simina went on to fulfil the potential that David recognised and achieved grades AAA for A-levels in art, graphic communication and media studies, securing maximum marks for art and graphic communication. In possession of outstanding communication skills, amusing and engaging, Simina has great potential and will no doubt go on to be a success in her future aspirations. Shiyoun joined Lansdowne College’s two-year GCSE programme in September 2015. She rapidly demonstrated her outstanding academic ability and achieved A* grades for each of GCSE Science and GCSE History in the summer of 2016. She is expected to go on to achieve a further A* grades in the summer 2017 GCSE examinations. Shiyoun is conscientious, committed, has a warm and engaging character and personality and is held in high regard by both students and staff. Furthermore, she is a leading light in the College’s debating society and a very competitive badminton player! A-levels including Latin and Greek lie ahead for Shiyoun and thereafter she aims to read Classics at Oxford or Cambridge; we have every confidence that she will achieve her goal.